Many of us would love to help birds, and also enjoy their presence in our gardens. One great way to do so is through plantings, or hedges. Help you maintain your fitness! 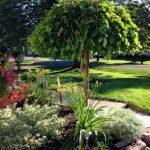 There are tons of good reasons to create plantings on your property. Most people are attracted to beautifully chosen plants, they add curb appeal and make spaces pleasant! But for now we focus on the birds, as we can also help them while making our spaces more enjoyable for humans. Let’s consider creating a hedge that will benefit birds. Let me tell you the wonderful benefits a hedge will provide our feathered friends! Just as you need a shelter to live in—no matter if it is a house, a condo, a tent or a cottage—we need a roof over our heads to keep the sun and the rain (or snow!) out. The birds also need protection from the elements. And this applies no matter what the season or which part of the world you live in. Birds need to keep dry. Even ducks, who love water and absolutely need it, need to stay dry inside their feathers, which is why they have very active oil glands. All seabirds and waterfowl in particular, have more oil production for this reason, to keep the feathers water-repellent. When you see ducks at the park, sitting at the edge of the pond preening their feathers and rubbing their beaks over their wings, that is exactly what they are doing! They are spreading around the oils from the oil gland (located on the lower back just above the tail). All birds do this, as all need “conditioner” to keep their feathers glossy and beautiful, and functional! They need to be able to stay dry, fly and so on. Wet, soggy feathers will transmit cold, which will kill a bird. Which is why oil spills kill birds—they die of hypothermia when their feathers become laden with petroleum, and can no longer hold a dry, insulating cushion of air. So the first thing to consider is that the hedge will give protection from the elements. Obviously, if you live in a temperate climate, there will be times of the year when trees lose their leaves. Bare branches don’t offer a lot of protection from wind and cold, so I recommend you include some evergreen plantings in your hedge. Let me also say that a hedge for wildlife—or just for people—need not be a single type of plant. You can combine a number of plants in a natural hedge, and it will look nice and the benefits will be multiplied. Birds have a lot of creatures who like them, I mean, like them for dinner! Hawks swoop in on birds in the open, so providing plants where the little songsters can fly into is a great idea. If you feed birds, you basically open a diner for hawks, so be nice and give the vulnerable ones a refuge to fly to in times of danger. This means the hedge or plantings must be nearby any feeders or waterers, bird baths and so on. The other dangerous “lovers” of birds include wildlife such as raccoons and foxes, and also the domestic (and feral) cat. Cats are now estimated to be responsible for killing billions of birds and animals every year, a shocking statistic! Do the birds a favour and keep your cat inside, and follow some of our tips on preventing cat predation. For the best protection from both weather and predators, a hedge needs to be wide enough to hide a bird inside. A skinny, sparse hedge won’t do the job. I realise it takes a while to get a hedge established. One way to get results quickly is to plant slower growing species along with some fast-growing vines. You can put together some kind of “scaffolding” or support around the slow growers, and use the vines to cover the supports. Holly: red berries in winter, the Christmas plant! All these evergreens can be found in various heights and widths to create a hedge. There is a wide selection of cultivars, and the factors of shade, sun and climate will influence your choice. Let your garden centre advise! Deciduous. Plants which lose their leaves also contribute leafy shade, food for bugs, shelter for nests, so don’t leave these out! Vines. These can be annuals, or perennials, which will form a permanent part of your hedge. I will deal with the latter two in follow-up articles, as the choices are huge!